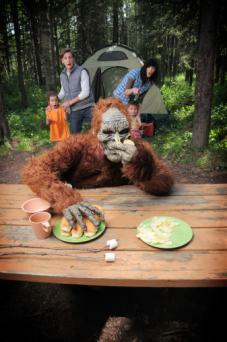 Safe camping pranks add a dimension of fun to any camping trip. Before you plan on playing any pranks, make sure your "victims" will be good-natured about practical jokes. There are a lot of safe pranks related to sleeping areas and beddings on camping trips. These pranks can be used to trick individual campers or the whole group before bedtime and while they are sleeping. 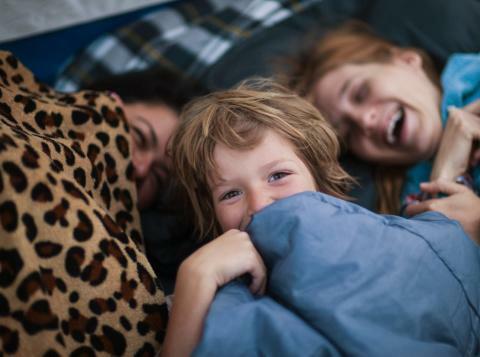 When no one is looking, switch all the bedding in the tent. One option is to take the top blanket and pillow off each person's bedding and swap them with someone else's. Another option is to rearrange the beds by moving air mattresses, cots, or makeshift beds within your sleeping area. If you want to make things really confusing, separate each person's pillow and blankets then swap them for those on a couple different beds. This way, people can't simply sleep in their new bed in its new location, they'll have to find all their own parts and put them back together. A quick and easy way to scare anyone while camping is to put something strange in the bottom of their sleeping bag. If you're camping in the forest, secretly collect some pine cones. Place several at the bottom of the victim's sleeping bag. When it's time for lights out watch them leap with fright when they settle into their bed. While your victim is sleeping, cover their entire sleeping bag top with Post-It notes. You can do the same thing while the person is away and cover their pillow along with the inside of their sleeping bag. For a larger scale prank, cover the entire inside or outside of your tent, cabin, or RV with Post-It notes while everyone else is on a hike or showering. 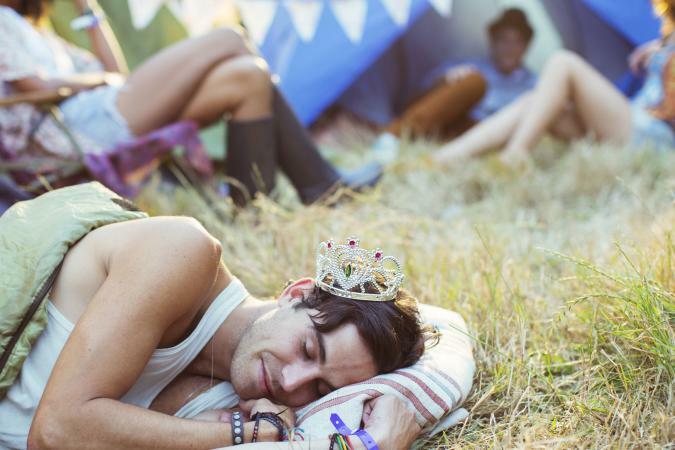 Have a little fun with sleeping campers by adorning them with funny hats or decorations. Set a tiny tiara on dad's head or place a giant sombrero on your little sister. Bring along some holiday decorations and drape garland or tinsel over mom's head and body while she sleeps. If you're victim is a heavy sleeper, he won't move much and will wake up looking silly. Just in case the victim moves a lot during sleep, snap a picture to share later. Unlike the prank where you draw on someone's face with makeup or marker, this prank won't leave any lasting marks making it more fun for everyone. When camping, you have access to wide-open spaces, a variety of natural objects, and opportunities to be secretive because people will be spread out. Try these pranks to trick your entire family or all the people you're camping with at the same time. This prank works best for those sleeping in a camper or RV, especially one with easy roof access. After everyone is asleep, sprinkle bread crumbs on the roof. Your secret treat will invite the early morning birds to peck away at the metal roof, making a mysterious racket. While this prank will wake up the rest of your family or group, don't forget it will wake you up too! If you can get up earlier than everyone else and spread the crumbs, it might work better because nocturnal animals like racoons may go after the snack in the middle of the night. Before you leave for camp, get a large, empty metal coffee can and drill a hole through the bottom center. String a piece of thick cotton rope through the hole and knot it inside the can. Pull the rope tight then use a small ring or other hard object to run down the rope. It will make a loud, animal-like noise through the can end. Bring this contraption along with you to camp to wake up the whole camp. If you're camping near a large meadow, you can create a crop circle to prank the entire group. Drill a hole near each end of a 2" x 4" piece of wood. String one end of a piece of rope through one hole, securing it with a knot on the underside of the board. Loop the rope and secure the loose end in the other hole with a knot. Make sure you can put one foot on the board and be able to hold the top of the loop at the same time. Using a similar motion to skateboarding or riding a scooter, wear down tall grass in a pattern with your board/rope creation. Coordinate with another person to make a large sized pattern in a short amount of time. Camping meals are ideal for food pranks because you typically have a lot of pre-packaged ingredients or snacks, and people work together to prepare meals. Fool everyone into thinking the beloved cooler is broken. All you need to pull this off is a full plastic water bottle and Duck tape. Use a knife or screwdriver to poke 5 to 10 holes in a circle around the opening of the water bottle. Keep the lid on the filled bottle for the whole prank. Flip the bottle upside-down and secure it to the back of the cooler with a strip or two of Duck tape. Poke a hole in the center of the bottom (now sticking up in the air) of the water bottle to serve as a vent. Make sure the water bottle isn't visible from the front view of the cooler. The water will leak out of the bottle, surrounding the cooler in a puddle. Since campers often rely on coolers and ice to keep their food cold, everyone will be thrown into a panic thinking all the ice melted. Replace all the burgers you brought with veggie or bean burgers, which contain no meat. Offer to cook up the burgers over the fire one night for dinner. Put all the burgers on buns and serve them up fully prepared so no one has a chance to take a peak under the top bun. When each person bites into their burger, they'll wonder if the burgers got spoiled or you're just a terrible cook! 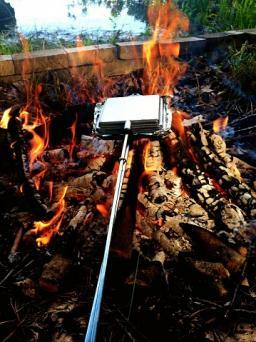 If you're cooking over a fire during your camping trip, you're likely to be using a pie iron. This long metal device allows you to use two pieces of bread as a crust for a kind of pie with fillings of your choice. When the iron is closed, you can't see the pie at all. Take advantage of this opportunity by switching out typical pie filling ingredients for something less appetizing. Instead of cherry pie filling, load the pie with red Jell-O. If you want a simpler prank using the pie iron, simply fill it with something slimy and alien-looking like canned oysters. Ask someone to open the pie iron for you after you've pretended to cook your pie. They'll be totally grossed out when they open it! The great outdoors are already mysterious and a little creepy. Add to the atmosphere by using nature to play tricks on your fellow campers. Safe camping pranks make camping trips more exciting and fun for everyone because they don't cause any real harm.